Monachil is a tiny village situated only 8 kilometres from the centre of Granada. Despite its proximity, it remains a place that is relatively undiscovered by mass tourism. The boundaries of the province of Monachil are fairly extensive and include several peaks over 3000m, including Europe’s most southerly ski station – Pradollano, Sierra Nevada. 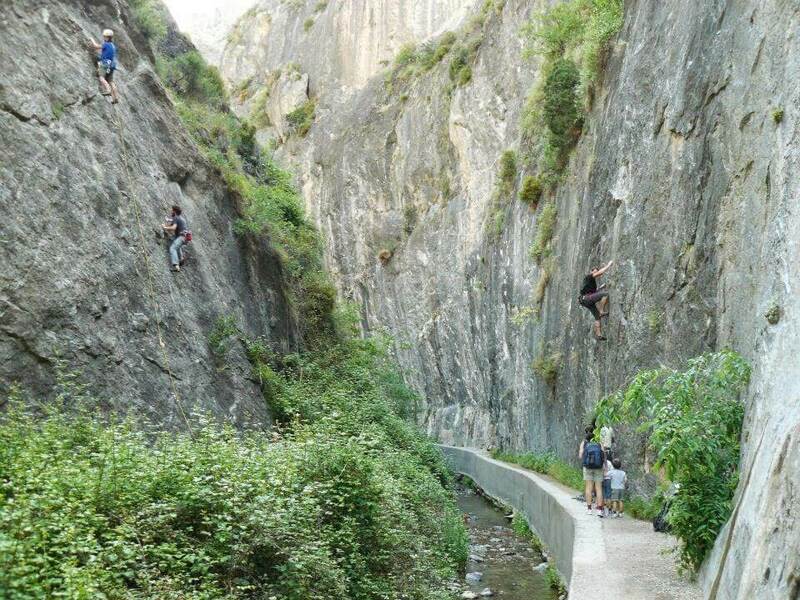 The impressive Los Cahorros gorge is situated 2 kilometres from the sleepy village centre. Until very recently, the gorge was only really known and appreciated in rock climbing circles, the steep limestone cliffs offering numerous routes for climbers. Word is beginning to spread with an increasing number of people finding their way to this natural paradise. As with most villages in the Sierra Nevada national park, the hiking in this area is second to none. One route in particular, is exceptionally beautiful. And suitable for families. A walk alongside and through the Rio Monachil – the Monachil river. Unbeatable views, waterfalls, plenty of rock pools for swimming, narrow caves and tunnels that you have to crawl through or hang off the rock face, walking alongside acequias that date back to Moorish times and, of course, the famous hanging bridges. The hike takes you through some spectacular Andalucian countryside. The walk is suitable all times of the year, but is particularly stunning in Spring and Autumn. The lush valley is home to numerous fruit trees (apple, cherry, pomegranate), wild flowers and herbs (lavender,thyme, rosemary), all interspaced with almond and olive trees. If wanting to swim, i suggest going in the summer months. The Monachil river has its source in La Velata – one of Spain’s highest mountains. The water is clean and cold. Very cold. A kind of cold that is only really welcomed on a hot summer’s day. Children will have the time of their lives. The walk provides a real Indiana Jones-like adventure for them. 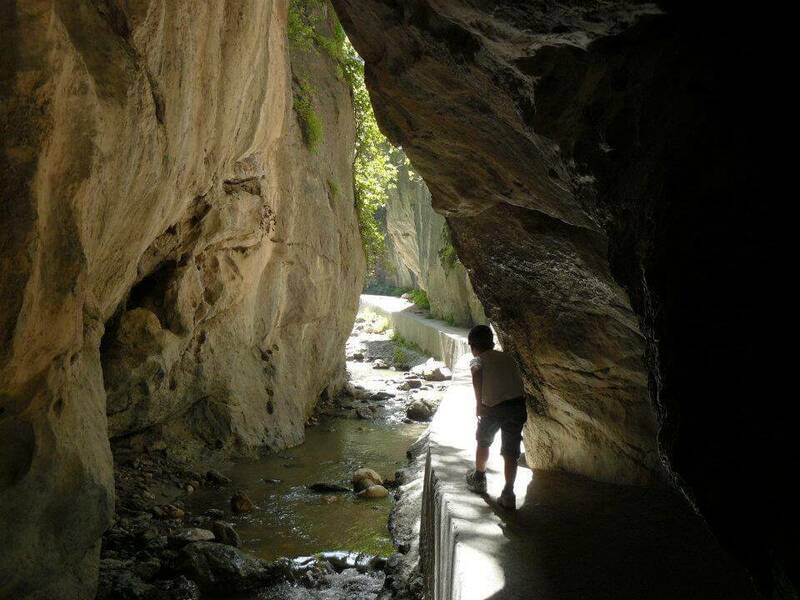 Walking across the hanging bridges, crouching and crawling through the tunnels and caves (the biggest is known as the La Cueva de las Palomas) and plenty of places to stop off for a cool dip and picnic. It provides a fantastic day out for the whole family. Despite the hanging bridges appearing very daunting at first glance – the longest is 55m long and is suspended a good 15m off the river. The bridges are very safe and time-tested. They do move and sway a bit while crossing, but it just adds to the fun. Severe vertigo sufferers may have second thoughts though! 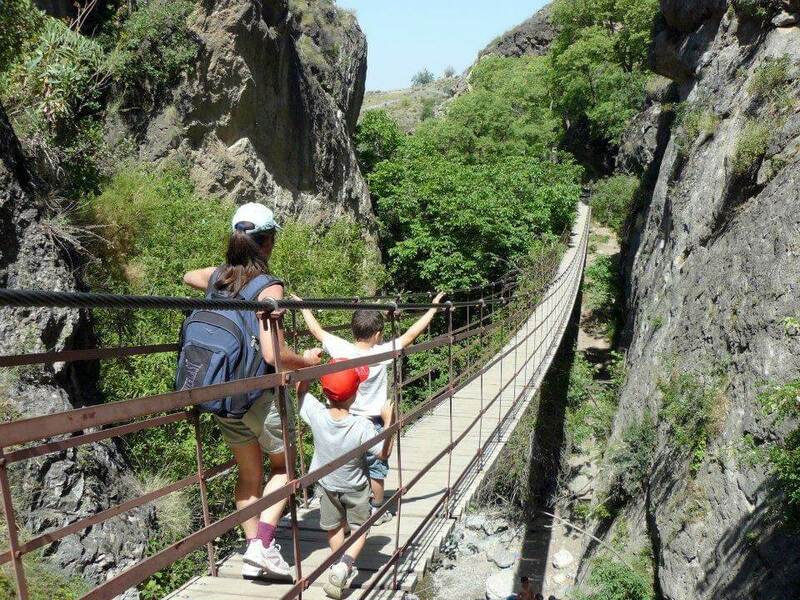 If following the full route, there are four hanging bridges to cross. The largest, is the first. A couple of the smaller ones, have sections missing and look fairly decrepit…..but they are regularly checked and maintained. We have been going for years and have never heard of any accidents or problems. The river itself has never been too full or fast flowing, if feeling unsure or unstable, you can walk through the water without any trouble. To get to Monachil, drive towards Granada – on the A292 if coming from the Costa del Sol. Just as you start entering Granada, follow the signs for Sierra Nevada. Be careful not to stay on the motorway and wind up in the center of Granada. It can be a nightmare working your way back out again. The ring road loops around the city. Take the exit for Sierra Nevada – exit 132 – signposted Ronda Sur/Sierra Nevada/Alhambra – map. There are two ways to start the hike. You can park and start in the village itself. This route is slightly longer, a total round trip of about 8kms. Or you can drive and park your car at one of the restaurants on the outskirts of Monachil. Many people park at (Restaurante El Puntarrón) that sits just off the main road. If you carry on a bit and take the first track that goes right. You can drive to another/smaller restaurant that sits almost at the entrance to the gorge. map. The food in both is very good and responsibly priced. If traveling with small children and particularly if going at the height of the summer (it gets very hot in these parts), its probably best to park at one of the two restaurants and start the walk from here. Drive into the centre of Monachil and follow signs to Los Cahorros. The road leads through the historical centre of the village and then upwards into the mountains. After a 2km climb, you’ll see the Restaurante El Puntarrón, on the right hand-side. For the simplest track that leaves from Monachil – see here. The route is linear, you can turn back at any point and walk back the way you came. There are several other options available including a longer circular route – see here. 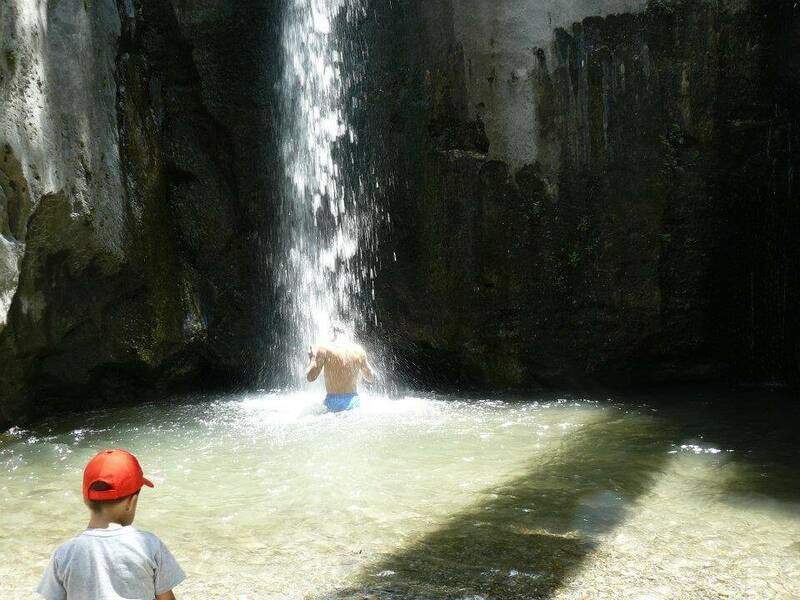 Another highly recommended family walk in the Granada area is the Cañada Sereno route in the nearby Sierra de Huetor natural park and for a more demanding hike, the Vereda de la Estrella is a classic. I originally wrote this article for Spain holiday here.